and a needlepoint of daisies. making petals one by one. of the plane like a cosmic benediction. with them aboard, would we? across the sky by my own hand. me to make a center for a change. Iris Miller has explored imagery as visual artist, art teacher to city children, art therapist, and shamanic practitioner, as well as through poetry. She believes in the power of the image to teach and to heal. As Patricia Ann Lothrop, she was raised in Reading, Massachusetts and earned degrees from Middlebury College and Cornell University. She has lived in Rochester, New York for many years, and spends summers on Monhegan Island in Maine. 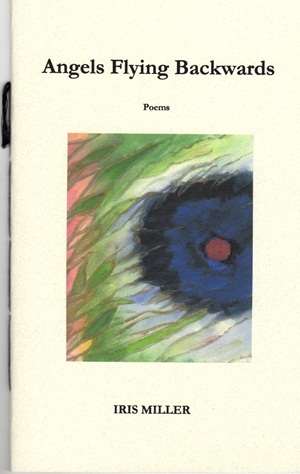 is a 28 page hand-stitched chapbook - $10.00.